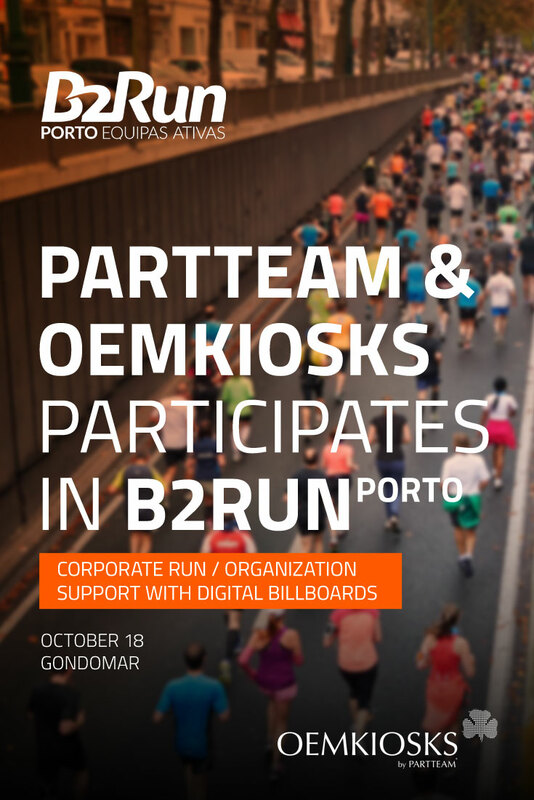 To be held on October 18, PARTTEAM & OEMKIOSKS and its collaborators decided to join the B2RUN Porto initiative. A concept that challenges several companies and their employees to participate in a 5km joint race, promoting the practice of sports and informal living among employees of various companies. PARTTEAM & OEMKIOSKS as a finalist in the competition "The best companies to work 2018", understands the importance and promotion of the health and well-being of its employees, providing moments of relaxation, socialization and entertainment, allied to the opportunity to strengthen personal and professional relations, between companies. It is an event designed exclusively for the business world, with an appointment scheduled at the Pavilhão Multiusos de Gondomar. Participation of PARTTEAM & OEMKIOSKS will not be just a sporting practic, granting the organization of the event several digital billboards, essential to the presentation of the event and its participants, associated companies, news, final results, among others.